A good motorcycle shirt comes in two categories: the classic black and the fun illustration. I silkscreened them both, what do you think? The most important requirement of the classic black motorcycle shirt is to camouflage the riding sweat. Once that’s out of the way you need a legible design that reps your local motorcycle stuff. Nothing looks better than white type on a black shirt. 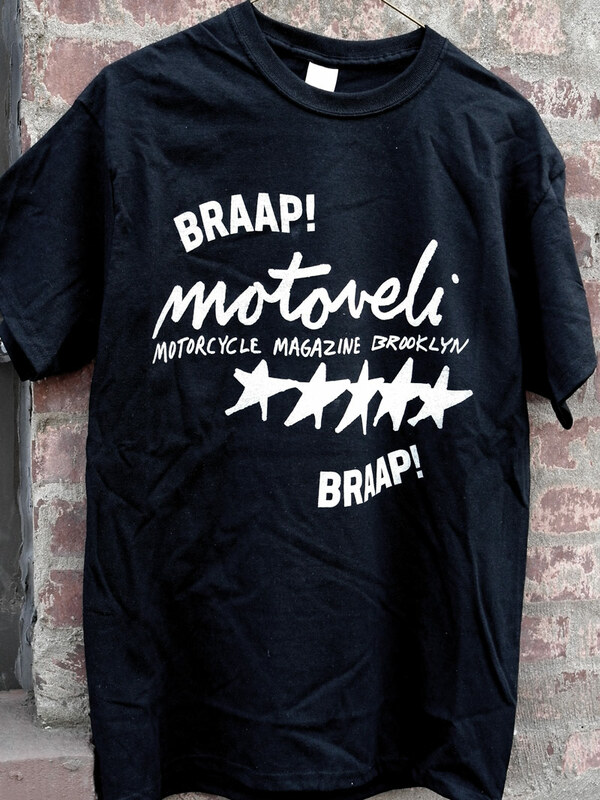 We added two braaps around the Motoveli logo for this, and boom, the BRAAP! shirt was born. This is the shirt that’s purposely off-brand even though it’s not. Think sketches of eyeballs popping out, lighting bolts, and….SKULLS! But who’s skull is that skull anyway? You know the scene in The Goonies when Mouth has to translate the map? Ye Intruders Beware… of the One-Eyed-Willie skull. And that’s the inspiration for the INTRUDER shirt. I silkscreened these shirts by hand and limited the run. There are 5 BRAAP! shirts left at Filipacchi, and 20 INTRUDER shirts in the online shop here. If you get one let me know by tagging @motoveli in your Insta story.